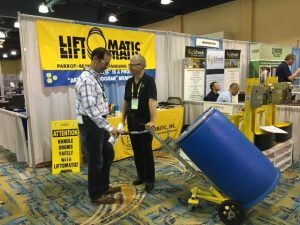 Unitzation of Chemical Drum Loads Archives - Liftomatic™ Material Handling Inc.
Each year, members of the National Association of Chemical Distributors (NACD) gather to discuss current operational opportunities, productivity enhancement, regulatory issues and training updates at the ChemEdge conference. The event provides training and education on all matters relevant to the manufacturing, distribution, warehousing and service and support for the chemical industry. The conference brings together hundreds of member companies from around the country to discuss best practices. The 2016 event was held at The Woodlands, Texas and brought together over 400 enterprise members, sharing information, technology and products and services to make the industry ever more responsible, efficient and profitability. One item that’s been discussed with more frequency throughout the NACD community is the concept of “unitized handling.” This relates to packaging and material handling techniques that lend themselves to efficiency, safety and cost effectiveness. Liftomatic has continually monitored and responded to industry’s efforts to improve the unitization of drum loads. 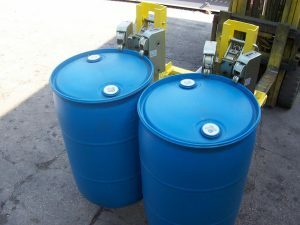 Beginning with simple 2-drum attachments for handling steel drums to a 4-drum unitized handling device for engaging all steel, plastic and fiber drums, Liftomatic products offer users an array of choices to reduce packaging costs (elimination or reduction of pallets) and space savings through stacking, storing and distribution routines . Automatic and mechanical forklift attachments allow drum users to increase safety and efficiency while greatly enhancing the unitized load concept. The NACD will hold ChemEdge 2017 at The Omni Nashville from August 15-18, 2017. For more information, contact the NACD at www.NACD.COM. We look forward to seeing you at the next show!